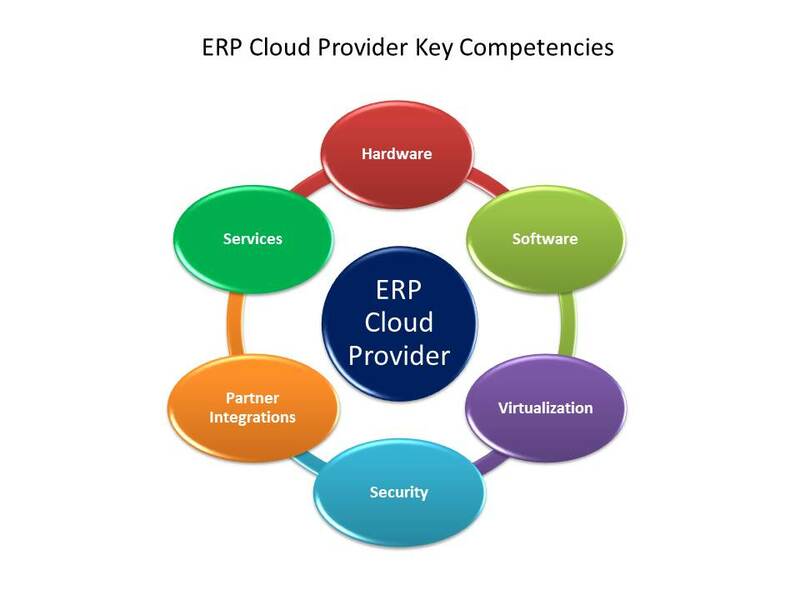 ERP Cloud: Finding the Right Provider | ERP the Right Way! I recently attended Oracle’s OpenWorld Conference in San Francisco this October. There was a huge volume of information on the Cloud. As I walked through the Exhibitor’s halls at the Moscone Center, I observed that every SI partner had ERP in the Cloud or could get customers to the Cloud seamlessly. 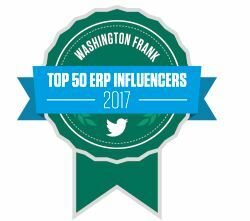 What I did not see is any offering or advisory service to guide ERP customers through the storm clouds to find the right provider. In the next sections we will discuss the key competencies to consider as part of making an ERP Cloud provider selection. Typically, this is the first area that customers think of when evaluating Cloud providers. For this discussion, hardware includes servers, processors, network, processors, and storage. Now, I may be chastised by my technology peers but I take a very practical approach to hardware. Business users are more concerned about technology results (reliability, response, availability, scalability) versus what hardware configuration is being used. I’m all for engineered solutions if they provide a material impact to technology results. I would not consider millisecond improvement on response time as a material impact on response time nor would I pay an additional $100 per hr /month for special hardware. Remember to keep the end in mind – you are moving an ERP solution to the Cloud. Review and identify Cloud providers that offer hardware configurations that best aligns to the hardware specifications and recommendations made by ERP software vendors. For this discussion, software competence focuses on software and standards that enable a viable Cloud solution. 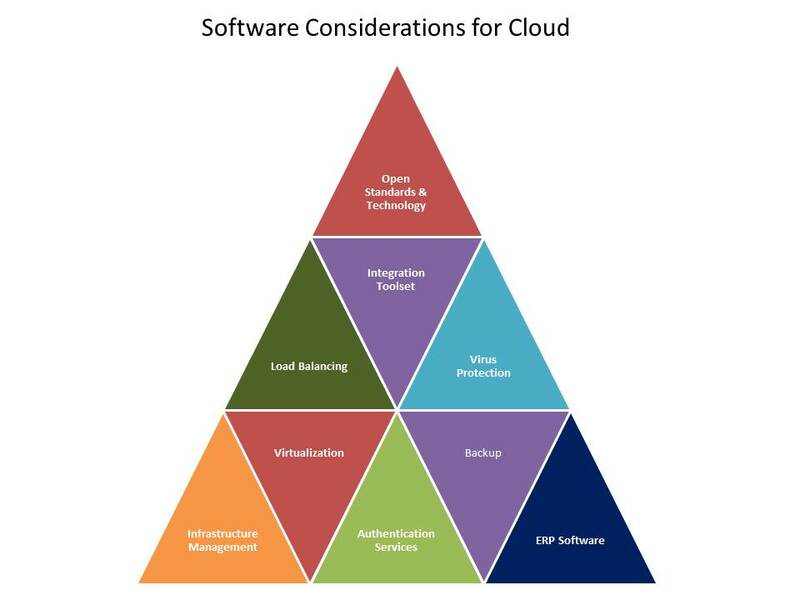 For brevity sake, we will focus on a few of the key software enablers for the Cloud. Open Standards & Technology Open Standards promotes interoperability and data exchange among different products or services and are intended for widespread adoption. This area will be a key enabler (and indicator) of portability. Integration A viable ERP Cloud solution must provide a robust toolset for integration back to the customer’s on-premise supporting systems. Integrations can be a potential point of failure that must be addressed with a cost-effective solution. Cloud + Poor Integration = Failure. Load Balancing Load Balancing is vital for effective distribution of work across a multi-tenant hardware environment. Optimal resource utilization, maximize throughput, minimize response time, and avoiding overloads are not possible without a robust load balancing capability. Be leery of simple load balancing algorithms like random choice or round robin. Virus Protection Viruses can live in the Cloud. Malware known as Crisis can infect VMware virtual machines. Moving to the Cloud does not end the need for antivirus protection. Virtualization Virtualization is a key enabler for Cloud computing. In order to realize the technology benefits associated with virtualization, Cloud providers must be able to provide a robust solution for the following capabilities: Elasticity – dynamic scalability is an integral feature (enabler) for agility and fundamental IT cost savings. Logical isolation for data protection. Hypervisor management for VMs.VMs replications. 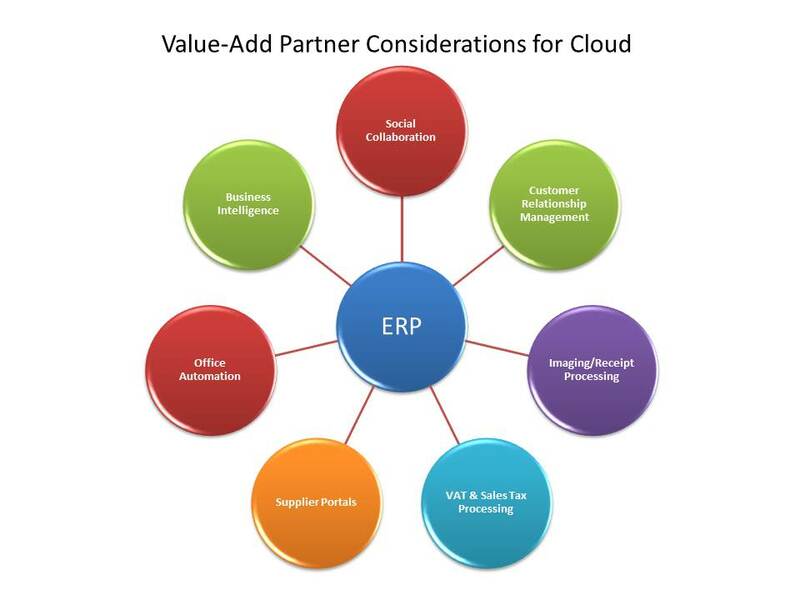 ERP Software Not all ERPs are created the same for the Cloud. Following are areas to review in determining how “Cloud-Friendly” is your ERP solution. Single-Tenant vs. Multi-Tenant – Single-Tenant provides a more formal logical isolation for customer data. Multi-Tenant reduces duplicate upgrade efforts and technology resources. SOA Compliance – How well does your ERP solution expose methods and related data components to external solutions via SOA services? Network Latency – High data volume transfer between Cloud server and the on-premise client. ERP Experience – Also ask if the Cloud provider has “hands-on” experience with supporting your ERP solution. A leading Cloud provider will have a competent level of technical support knowledge for your ERP software. Security is a key selection criterion for Cloud providers. A realistic expectation is that Cloud providers should have a greater level of security than your current on-premise IT environment. Following is an illustration of the key security areas you should consider as part of your ERP Cloud provider. There are three key areas that I would like to further discuss. 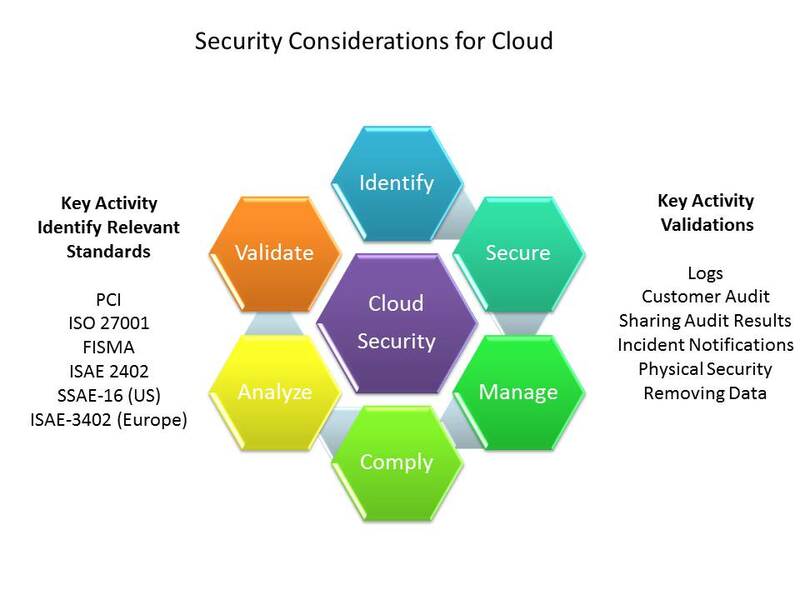 Identify Relevant Security Standards: Viable Cloud providers should be able to assist their customers in identifying and applying relevant security standards for their specific industry. Security Validations: Leading Cloud providers are able to demonstrate their security competence via (a) audit and evidence gathering, (b) providing security audit findings for customer review, and (c) enabling customers to perform independent security audits if desired. Data Encryption: Encryption of customer data either in transit or at rest should be a non-negotiable requirement for Cloud providers. Every ERP solution has a portfolio of edge products/3rd-party integrations to external solutions. It stands to reason that customers should consider the portfolio of ERP edge products that a Cloud provider can host as part of the selection process. Selecting a Cloud provider is not a short-term relationship so ensure that you can grow and generate greater value from your ERP investment within the Cloud. 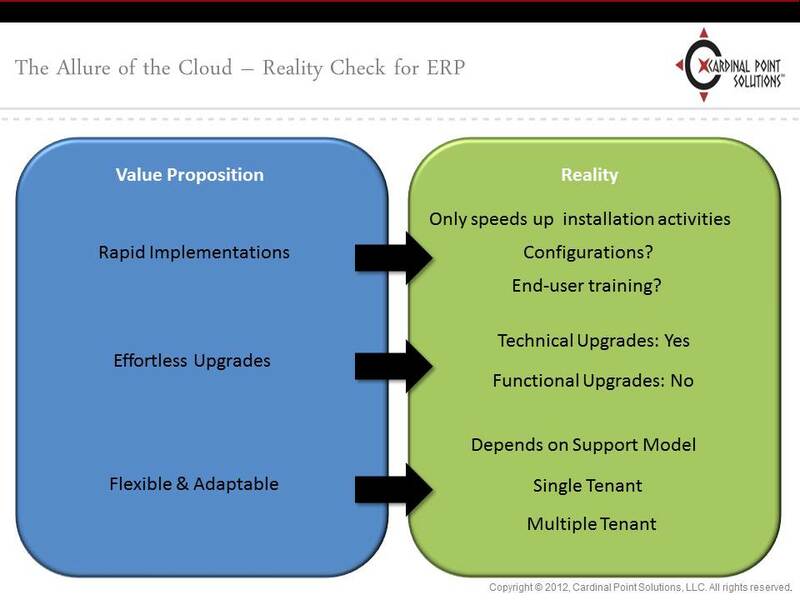 Reality Check for ERP Cloud. Used by permission. Technology is only part of the solution. What is the value of providing new ERP features if end users are not formally trained? Who will perform regression testing for both technical and functional upgrades? In my mind, a leading ERP Cloud vendor should provide both an automated testing solution and on-demand training solution to facilitate rapid deployments. Cloud providers should have a services framework such as ITIL or ITSM. This is a validation that your Cloud provider is committed to delivering reliable professional services. Overall, I am very excited about the opportunities that Cloud can offer to existing ERP customers and potential customers who could not afford a Tier 1 ERP solution. Yet, we must not forget that there are advantages and challenges that we must address in order to provide a reliable solution for ERP customers. It is also important that we keep realistic expectations for the Cloud. Cloud is more about a new way of delivering computing resources versus being a new technology. P.S. If you are interested then the blog author will conduct a webinar: Best Practices for Selecting the Right ERP Cloud Provider. Overview – Next stop: The Cloud! Everyone is talking about it but there is a fog of disjointed information out there regarding moving to the Cloud. In this webinar we will demystify the cloud and discuss one of the key activities customers should carefully consider in moving to the cloud – selecting the right cloud provider. We will also discuss some of the key factors to consider as part of your cloud deployment strategy. Register at http://www.oracle.com/go/?&Src=7604459&Act=251&pcode=WWPN12035291MPP257 . Reblogged this on Stuart Riesen. Thank you Stuart for promotion. Very true, good article, I just wanted to add my 2 cents: also keep in mind for data transformation/conversion, means how well information is defined on the ground level data. Thank you for the feedback – I appreciate it very much. I believe that your question does raise the requirement of having a robust metadata management scheme/solution. Do you agree?